There are just 6 days left to get every thing done before the big day!!.!!!!!..!! I still have loads to do, I still have some shopping to do, crackers to make, tree to put up and decorate, cards still to write and presents to wrap. I do have a terrible habit of leaving things to the last minute LOL. Oh well it wouldn't be Christmas to me if I got every thing done with time to spare. I just love that last minute rush and panic to make sure things are done. I'm just a glutton for punishment. I just want to take the time now ( just in case I don't get the time later) to wish you all the very Happy Christmas and a wonderful New Year. And I hope Santa brings you his most special gift of love and happiness, wrapped up in family and friends. I got the inspiration for these cards from Pat a crafting friend of mine. I hadn't seen one before so had to make one myself. Then I just had to make one for another friend of mine for her birthday. This is a Christmas present card closed and the first one I made. And now the card open. As you lift the lid of the present the teddy pops up. I loved making the first card so had to make one as a birthday card, and gave me the the idea for my friends birthday. And this is the one I made for my friend. Well that's all for now. Thank you for visiting and see you again soon. This morning I walked into Heanor. I took a few photos on the way. These photo's were taken just out side Smalley village, about 8.30am this morning. And this is what greeted us when we got to the shop. Lorries just couldn't get up the hill past the shop. At one point there was 8 lorries stuck on Derby Road. In an effort to get up the hill the leading lorry ends up stuck in the middle of the road. I didn't stay at the shop all that long, just long enough to phone the ladies to cancel the classes that were scheduled for today. Not that anyone would turn out in this lot but you never know. The next photo's were taken on the way home. Later in the day I took the dog for a walk. 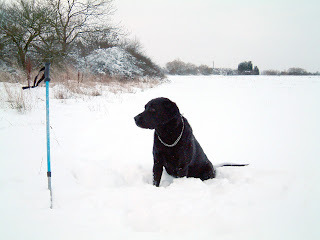 The snow is just beautiful but boy it has caused a lot of disruption. Dan our lab didn't look as though he minded all that much. In fact he was loving it. I hope it's not that long before things can get back to normal. Just a quick post today to share with you that I have found a new use for my old Sizzix machine . Last week I got a large order for some Christmas cards. This order involved a lot of stamping and was making my wrists ache and I thought to myself , I could do with a stamp press for such occasions. Well this got me thinking. I still have the original Sizzix machine which sits in the corner of the craft room, unused and unloved. I dragged it out dusted it off and started experimenting. With a few adjustments it worked a treat. I got the rest of my stamping done in no time and pain free. The stamps I was using were unmounted rubber stamps which I stuck on to an acrylic block. I'm chuffed to bits with my new stamp press....... that I didn't know I had. As soon as I can I will put up some pics to show how it works. Thanks for visiting see you again soon. In my last post I said I would show you how I stamped the wreaths for two of the cards in the Timeless Classics post. I must apologise for some dodgy photography, the images are a bit blurd. Click on the picks to see a larger image. First draw a faint pencil circle on the front of your card. Decide which part of the image you want to touch the circle. 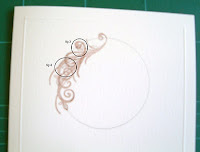 I have circled the parts of the stamp I chose for my wreath, see fig 1 and 2. Then with the chosen stamp, stamp onto the pencil mark. Next you need to decide where to stamp next, this is the point that you will use each time. See fig 3 to see where I use for this card. With each repeat stamping it will get more difficult to see your stamp positions but you will if you concentrate. 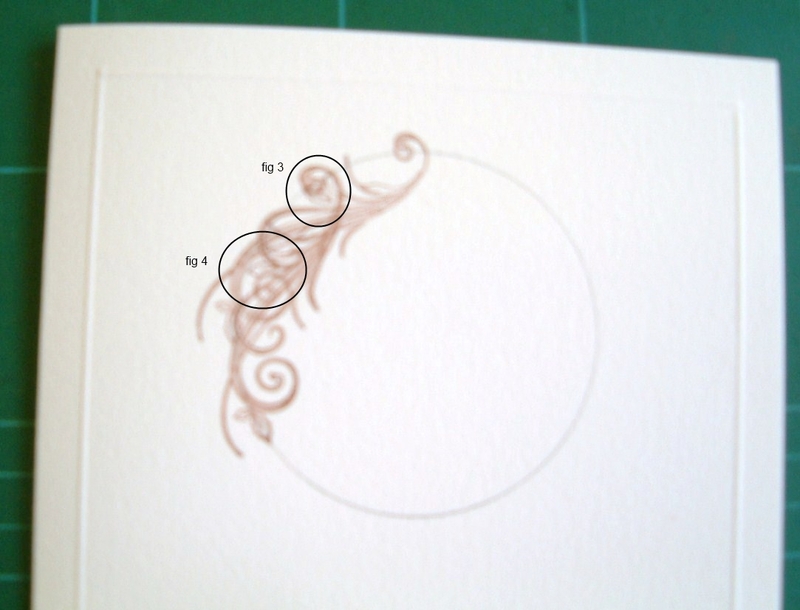 See figs 3 to see the second repeat and and fig 4 where the third repeat will be stamped . Keep repeating the stamp around the pencil mark until the wreath looks complete. Now it is done, decorate as you wish. I hope this all makes sense, and you give it a go. Thanks for visiting my little crafting sanctuary. See you again soon. 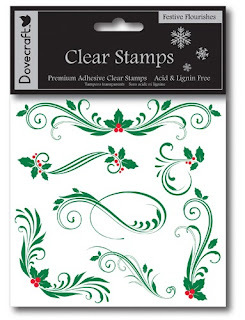 As promised in last nights post I have three cards to share with you today, they are (I think) three simple timeless classics.The stamps that I have used are Festive Flourishes, a set of clear stamps from Dovecraft. To see these cards in more detail just click on the picks below. For this card I used one of the stamps from the set. I made a poinsettia using a leaf punch and a snowflake punch, the centre of the poinsettia is some gold seed beads. This card I used another stamp from the set to stamp a wreath. I used a holly punch and a sml leaf punch to decorate it. And this one I use another stamp from the set. As in the second card I used the stamp to create a wreath this time though the only decoration I added is the gems and the ribbon bow. In my next post I will show you how I stamped the wreaths. Thank you for visiting, see you again next time. To let you know I have a little preview for you. Tomorrow I will be showing you three cards I have made using these clear stamps from Dovecraft. The cards I have to show you, are (I think) timeless classics. I hope you will agree. Ok I will see you tomorrow. I have more stamps from Michelle Marsden with a taste of the orient. I have to tell you I have had fun with these. Here is the card I have made with them. I used my Inkadinks to colour the images with. I love this card shape as well, I think it works well with the stamps. Every now and then you make a card that you are totally happy with. It doesn't happen very often but this is that card for me. I am so chuffed with how it turned out. I hope you like it too and I just love the stamps. Thank you for dropping by, see you again soon. Here I am again with the second post of the day, and another experimental card. Last week I got in stock Marianne Design Creatables Stencil cutters. 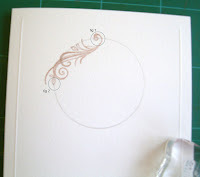 I was looking at the Swirl Leaf when an idea came to me. This is the card I came up with. To create this I cut the swirl leaf from a double sided adhesive sheet with my BigShot ( if you have a Cuttlebug you can use that) and laid it on a piece of card stock . I covered the adhesive in silver coloured gilding flakes and then three punched flowers. This is the first time I have worked with the flakes and I have just love the effect that you can get. I have a feeling it won't be the last time I use them either lol. Well that's all for now. Thank you for visiting my little blog. I hope you have liked what you have seen today. See you again soon. I have just had in the shop some new stamp sets from Michelle Marsden. I have used in this card the Flourishes Stamp Set. These are unmounted rubber stamps on one sheet which you have to cut out. I used a recess card for this. I stamped up the card before making up the recess, masking off the areas that I wanted to stay white. I then added three spiral quilled roses to finish it off. 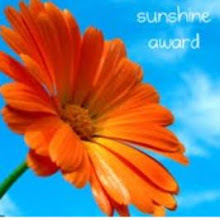 Thank you for visiting my little blog. See you again soon. I know it has been a while since my last post. I have had a lack of inspiration lately which has not helped, and if I am honest I think that has knocked my confidence a little. I have also been busy doing a scrapbook for a customer, and now I have got that finished I can get around to updating my blog, because in between the scrapbook pages I have made a few cards. The first card I want to show you is an 8" X 8" scalloped card . I made a poinsettia flower with white lace ribbon. I love the white on white with silver accent. The second card I have for you is this one. For this card I used the NOEL embossing folder from Crafts too. I inked up the folder in red and green in a random fashion before embossing my piece of card. I was rather chuffed with this one it was so quick and simple to make. Well that's it for now. Thank you for dropping by to take a look. See you again soon. 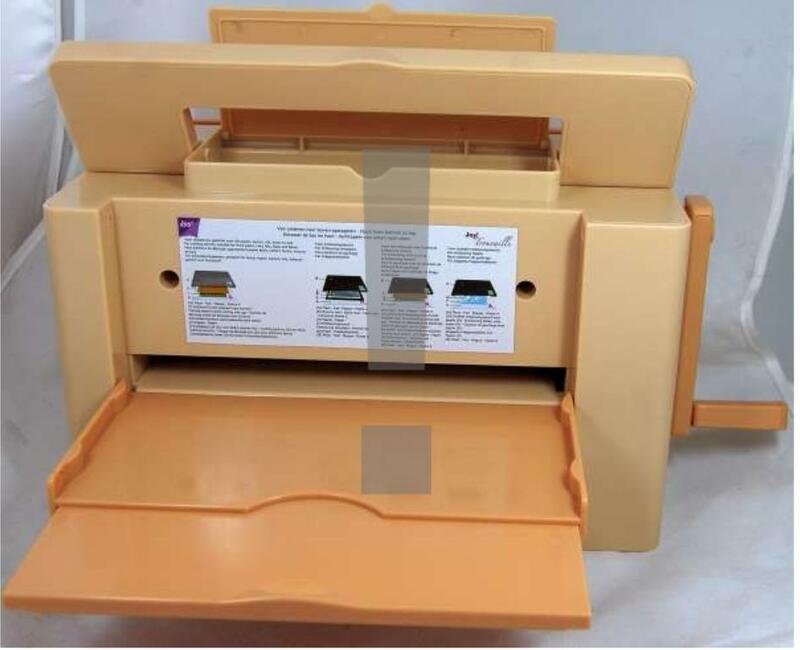 At last a cutting and embossing machine capable of utilizing up to A4 size stencils and dies. This machine is able to use the new Grand Nestabilities due out in October, as well as any of the other Spellbinders cutting die's. You can also use in this machine the Cuttlebug cutting die's as well as the embossing folders. The only dies you can't use are the Sizzix Die's. You can now do all those aperture cards you have always struggled with. I have been asked how I emboss the border around the cards and what with, in the post "Ribbon ribbon ribbon". So I have done this little tutorial to show you. You don't have to have anything special, anything that embosses straight lines will do. First I am going to show you how on a Fiskars 30cm paper trimmer. In my opinion a useful tool to have in your craft kit. Not only can you cut card or paper with it, you can score with it too. This is how the card will look. First of all mark on the inside of the card with a pencil 1cm in from the edge on all 4 sides of you card, as shown in the pic's above. Mark lightly because you will want to be able to rub it out after. Line up the marks you have made with the groove in the trimmer and using an embossing tool or bone folder, emboss a line between your marks. Turn the card and emboss the next side. Turn the card again and emboss the third side. Now emboss the 4th side, the side near the fold. again as in the other three sides line up the marks with the cutting groove. If your lines don't meet up just go back and join them up. Here is the card again finished. I hope you find it useful. This is just one little basic thing you can do, you can also emboss a pattern using strait lines if you wish. Next time I will be showing the same tutorial using the Hougie Board. Just a short post to day. I don't have a card for you but I do have some useful stuff for you. I do a lot of surfing the net for inspiration especially when I get a mental block. On one of my journeys around the blogging world, I found this very useful tutorial called "Run for the Border" on Crafting With Sue's blog, using Martha Stewart's punch around the page border and corner punches. Sue has done a fantastic tutorial showing a way of always getting the perfect four-sided border from these punches. If you have any of these punch sets you will find this tutorial very useful. It's so simple I wished I had thought of it myself :) . I have put a link in the side bar for this tutorial . under the heading of Useful stuff. Well that's all for now thank you for stopping by to take a look. See you again soon. I love making these ribbon flowers they are soooooo easy to make. After making the cards in the last post I saw the Splitcoast Stampers clean and simple challenge krafty turquoise, so thought I would make this card. I love this colour combination. I couldn't think of another design so I used the same as in the last post. I'm not sure if I like it now though. Oh well we all make cards we are not sure of from time to time. Any way thanks for looking see you again soon. I have two cards to show you today, I hope you like them. I have been making ribbon flowers. For this card I have used a cream crocheted ribbon to make the flower, teamed with cream satin ribbon and kraft card, all mounted on white card. For this one I used a silver coloured satin edged chiffon ribbon with a white and silver snowflake centre. The embossed background is Polker dots from Cuttlebug I like these new 5 X 7 folders means you can emboss more card in one go :) This looks so pretty, well I think it does anyway lol. Well that's all for today. Hope you like them, thanks for looking see you again soon with another card.